Stone plates are generally a piece of natural limestone carved into a rectangular plate shape for use as a lithograph plate. The surface of the plate is polished flat with emery or something to that effect before it is used. The chief component in the stone is calcium carbonate, which makes up 94% to 98%, with small amounts of other minerals such as iron oxide, aluminum oxide and magnesium carbonate. The porous nature of the natural sandy grain in the stone provides a precise surface. When the proof is made after drawing, the stone converts to fatty acid calcium stone on the drawn areas to provide a lipophilic area and forms a water retentive film of mucic acid on the non-plotting area to provide a hydrophilic area. The color of the stone depends on its age and the ratio of components. The older stones are dark blue, changing to greyish blue, grey, pale yellow and white in the newer stones. They range from hard to soft in toughness. The harder the stone, the more resilient it is to acid and the more difficult it is for the drawing to be damaged. Softer stones, on the other hand, are vulnerable to acid and are more sensitive to oil. They originate from many locations but the best quality is from Solnhofen in southern Germany. The word, lithograph, has its roots in the Greek language meaning “writing in stone” and stone plates have long been in use since planography was invented by Senefelder in 1798. Because of the difficulty of obtaining them and the numerous disadvantages such as the weight, variations in quality, cost and printing capacity, metal plates are often used in Japan today. However, because of their capacity for expressing tones, the compatibility with techniques such as scratching and undertaking repeated changes in a work, stone plates offer features and the ability to use techniques not present in metal plates. Stone plates allow repeated surface grinding. Further, if the stone has become too thin, it can be reinforced with a stone or concrete backing. 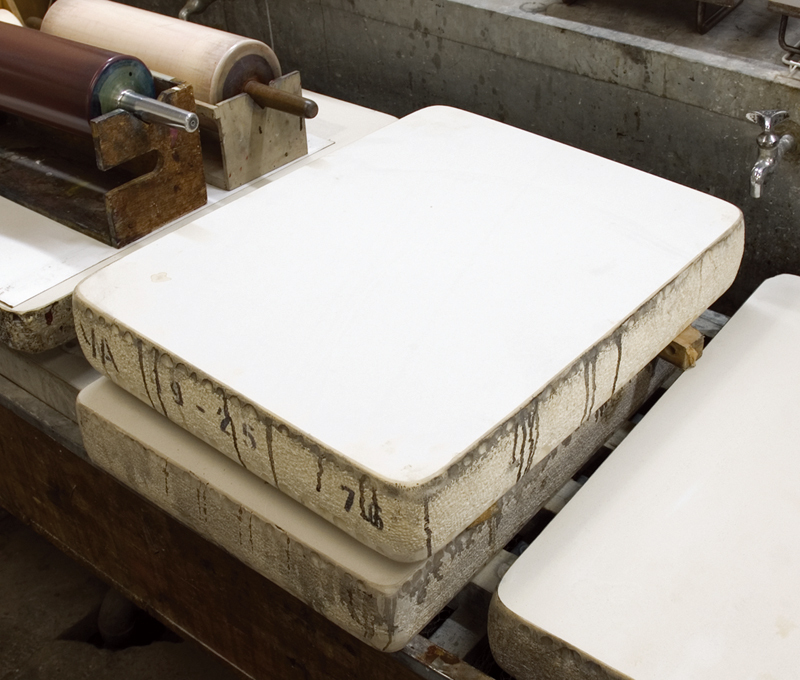 Stone plates can be obtained at specialist stores that handle lithographic supplies.